Panel Review: Can ‘Big Food’ Embrace Sustainable Agriculture? Admission: I’m inclined to judge these names and titles quickly, breaking them down into “us” and “them.” Afterall, I grew up as our culture started to summarize complex issues in the few words of a bumper sticker or a t-shirt slogan. To the credit of everyone involved last night, the panel facilitated a conversation. As an easy definition of sustainability, we say it’s when something is good for the three P’s: people, planet and profits. In speaking of agriculture, the P in people quickly becomes the P in population. The human race is expected to nearly double in size to 9 billion by 2050. No one is sure how we will feed this many. A question emerged from the panel: To feed the growing population, do we need to increase food production or can we accomplish this by improving food distribution channels? To this end, Josh Viertel gave an astonishing statistic: Last year we made enough food to feed 11 billion people. “We don’t have a production gap, we have a distribution gap,” he said. Michael Doane of Monsanto advocated for increased production as the solution. His company develops biotech seeds — seeds infused with a trait to resist drought or certain pests, for example — that create more prolific crops. According to him, there are two billion acres of biotech crops around the world. They are starting biotech rice in China. (Yes, the biggest crop among the world’s largest population is going biotech.) Only the Europeans are holding out against this technology. In response, I understand the quickening of our collective heart rate as we think about a food crisis one generation away. Many forces are working to address this immediately. But in the break-neck pace of solution (and market share gain), we risk undermining a delicate ecological system. Monsanto has a Research and Development department that constructs new seeds to conquer the traditional problems of farming. But the problem with genetically modified seeds or biotech seeds is that Nature also has its own R & D department. The biotech seeds may solve a weakness for awhile, but over time, Nature returns with a more robust pest or plant disease. At very least, biotech does not solve problems for the long term. At very worst, it irreversibly tampers with the agricultural heritage of which we are the guardians. Improved distribution channels, including the decentralization of food. More local providers and thus shorter food chains. Vertical Farming: An urban-based system using closed-loop hydroponics. 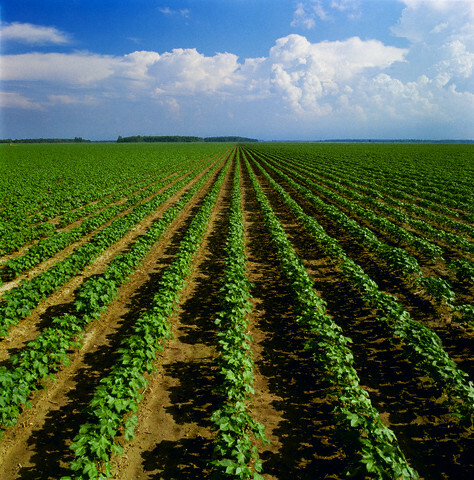 Crops are located where the population lives. We preserve seed integrity and there’s no need for pesticides. Increased global productivity through better farming techniques and training. And the expansion of our growing surfaces: Rooftops, abandoned lots, etc. Yes, these other ideas are in the nascent stage of development. But when we consider what’s at stake — food for human beings — how can we not develop these ideas first? The answer to the question of whether it is increased production or improved distribution is likely both. Not at the risk, however, of manipulating seeds when many other workable solutions exist. I stand with the Europeans on this one. Readers, I’d love to hear from you. This is an example of one of the major drawback of biotech: once these genetically modified organisms are cultivated, they “jump the fence.” Previously, genetic polluter Monsanto won cases against farmers for “copyright infringement” when seeds or pollen contaminated crops. It’s refreshing to see the tables turned against the biotech industry for this sort of ecological negligence. Hi Patrick — No, I had not seen this story. Thank you for posting it! Anti-technology activists accuse corporations of “playing God” by genetically improving crops, but it is these so-called environmentalists who are really playing God, not with genes but with the lives of poor and hungry people. While activist organizations spend hundreds of thousands of dollars to promote fear through anti-science newspaper ads, 1.3 billion people, who live on less than $1 a day, care only about finding their next day’s meal. Biotechnology is one of the best hopes for solving the food needs of the poor today, when we have 6 billion people in the world, and certainly in the next 30 to 50 years, when there will be 9 billion on the globe. Products from biotechnology are no less safe than traditionally bred crops. In fact, they may be even safer, because they represent small, precise alterations with the introduction of genes whose biology is well understood. Often these genes are derived from other food crops. Further, genetically improved products are subjected to intensive testing, while conventional varieties have never been subjected to any such regulation for food safety or environmental impact. Hi Chris: Thank you for your comment. Everyone is entitled to his or her opinion, and I appreciate you stating yours. I’m not anti-technology at all, but I oppose the genetic modification of seeds. Technology will play a big role in the way we feed the larger population. I want to see it used, however, in building more efficient distribution systems and other safe developments. We all inherit the right to seeds and the food they produce. I know that Monsanto develops seeds — a product — and then gets a patent on the product they have researched and funded to market. But if I — or anyone else in the world — does not want my food to result from genetically-modified seeds, that is a right I have. Regarding people who live on less than $1 a day, I support the advocacy work of Vandana Shiva in India. For an example of her thinking, please see this clip. Interesting that there was no farming organization invited to speak. Slow Food is advocate organization, but strange that there was no presenters to represent independent sustainable farmers. Hi Linda: Slow Food and the Rainforest Alliance both did a great job of advocating for independent farmers. Is there an organization you’d recommend to serve this role at future events? So much is going on in this area — perhaps there are new alliances forming as we correspond! I look forward to hearing from you. Thank you for writing in.